For portrait photography, the best choice is Sony’s FE lens: Zeiss FE 55mm f/1.8 ZA lens, a price for $998, also the 50mm f/1.8 is another good prime lens for Sony A6000 yet has a very cheap price. And the Sigma 60mm f/2.8 DN E is another great lens for Sony A6000. 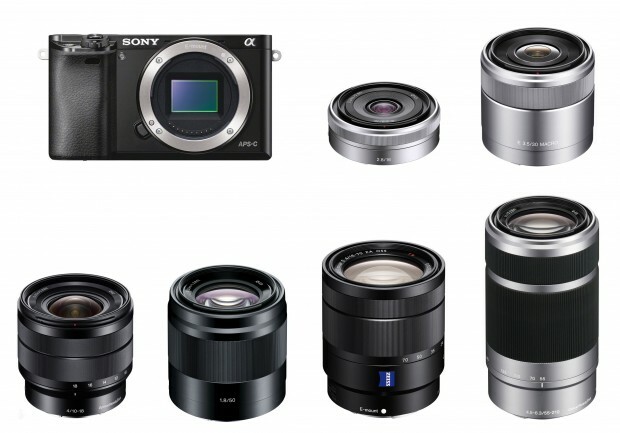 Currently, there are a lot of great zoom lenses for Sony A6000, Other than Zeiss FE zoom lenses, the best zoom lens for Sony A6000 is?Sony Vario-Tessar T* E 16-70mm f/4 ZA OSS lens. This lens has good result tested on Sony A6000. If you looking for a cheap one, you can try the kit lens: Sony 55-210mm f/4.5-6.3 E-mount lens. Below are a list of wide-angle prime and zoom lenses for Sony A6000. The best wide angle prime lens for Sony A6000 is Zeiss Touit 32mm f/1.8 E lens. And best wide-angle zoom lens for A6000 is Zeiss 16-35mm f/4 FE lens, the Sony 10-18mm f/4 lens is also another good lens with a more cheap price. Currently, there are not many telephoto lenses for Sony A6000, below are recommended telephoto lenses for Sony A6000. Two new announced Rokinon/Samyang 85mm and 135mm lenses are good choice for Sony A6000 at a cheap price. Here are recommended macro lenses for Sony A6000 camera. Previous Previous post: Rumors: 5D Mark IV Price for $3,799, to be Announced on March 17th, 2015 ?